Grasshoppers can be seriously destructive in the garden. This brightly colored grasshopper is most likely a Differential Grasshopper, Melanoplus differentialis, in a yellow color stage (they can vary in color and also change color). 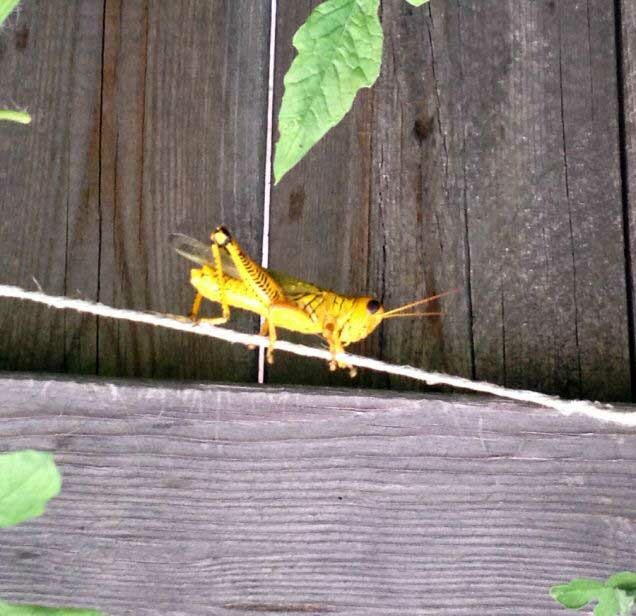 This is one of the most common species of grasshoppers in Texas. Grasshoppers generally produce one generation per year, however cool dry spring weather can encourage large populations and different species to develop at different times of the year. Mid-July is typically the time when you’ll start to see most adult stage grasshoppers in the garden. They are swift chewers and can destroy many plants and crops quickly. Treating grasshoppers is most effective in the spring when they are young. Fully mature grasshoppers can be difficult to control.